Update February 3, 2014 – A list of 16,101 prisoners who were at Goli Otok from 1949-1956 was released on a Croatian website this week. It listed 413 people that died while serving time on the island from 1949 – 1956. The death of Momar Ghadafi last week has me thinking of dictators. His 42-year reign did not end well with “rebels” finding him in a storm sewer under a road and beating him and then executing him. This is much different than here in Serbia with the end of their Yugoslavian Dictator, Tito. His 37-year reign ended with a state funeral and honors. Many still regard him as hero, not only for his exploits in World War II, but also for keeping Yugoslavia together and more prosperous than its Warsaw Pact neighbors. Does he qualify as a dictator? Zoretic was captured in Austria and sent back. He writes in the book that he fled the country because he could not find a job. According to him, his father refused to join the Partizan army during the World War II resistance. He also didn’t join the Chetniks, the other resistance group. Zoretic’s father was executed and tossed into an infamous deep cavern called “Jazovka” near the Slovenian and Croatian border. He was one of the lucky ones, because many Croatians taken there by the Partizans were tossed in alive, only to die slowly hundreds of meters below the earth on the remains of the dead. Zoretic didn’t know the full background of the story if his father was a collaborator with the Ustaše or just an ordinary civilian who didn’t want to participate on any side in the conflict. Recall that the Ustase were the Croatian Nazi collaborators in World War II. Because of his father’s background, Zoretic couldn’t start a career and find jobs or enter training programs in the Partizan-controlled Yugoslavia. Talk about suffering for the sins of your father. He eventually got to leave Yugoslavia after serving out his sentence. He wrote the book while in exile in Canada and I read where his son is raising money to produce a film based on the book. The photo above is not the island of Goli Otok, but of Lokrum Island, located just off the coast of Dubrovnik, Croatia. 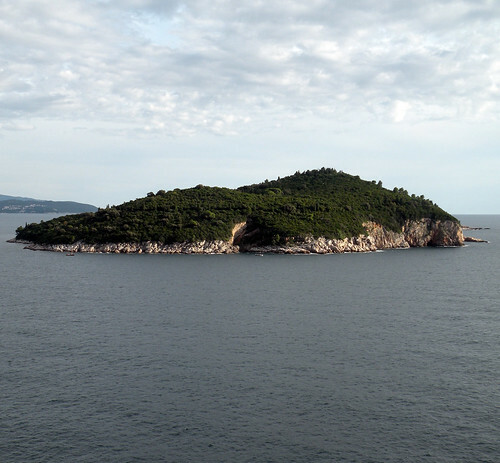 It is a similar island and we visited Dubrovnik last year. It will give the reader a sense of what the place looked like.We didn’t get over to visit the island, which I don’t think is a tourist attraction. It would be good to restore the island. It is not as famous as the American island prison Alcatraz. Unlike Alcatraz, prisoners occasionally escaped but it was dangerous and difficult. I hope they do preserve the island as it has been left to ruin and an important part of history is being forgotten. The book was an engaging read, as Zoretic described daily life in the prison. I was a bit put off by his “Greater Serbia” conspiracy theory. The Secret Police Chief under Tito at the time was a Serbian named Aleksander Ranković. He was the top Serb in Tito’s regime and was accused by the author of unfairly favoring Serbs when it came to sentencing.The guards were quite sadistic and cruel and I don’t understand how anyone could act that way towards another human being. Zoretic mentioned that some of them after leaving employment on the island were attacked on the mainland because people heard of the conditions on the island. Goli Otok is a sad chapter in the history of Yugoslavia. It is a reminder to us all that humans can treat each other cruelly and the opression of the Tito-led communist Yugoslavia. I recommend the book anyone interested in learning more about Yugoslavia. Otok is Croatian word for island. Ostrvo is Serbian. You don’t think. Latin was dead long ago (only priests spoke it) and Hungarian (not German) was official language for Croatian nobility. Common Croats spoke Croatian (shtokavian-kaikavian-chakavian mixed dialect in literature and each of them alone among the people) at that time. “Otok” is Croatian word for island, “ostrvo” being Serbian equivalent. Thanks for sharing your thoughts on the book! Interesting blog. Josip is my wife’s uncle and it is nice to know that people are reading and enjoying his book. Just to clarify, a few things, Josip wasn’t born in Slovenia, he was born in a small village an hour or so from Karlovac. He also neither suggests in the book, nor believes, that his father was a part of the Ustase. His father wasn’t interested in joining up with anyone and this basically was the reason why he was killed. It also wouldn’t have made any sense to join the Chetniks, not that they were in the area anyways, as they were strictly a Serbian group. Otherwise, again, thanks for reading!